With the Boston Bruins being an Original Six NHL team fans have been treated to some historic goaltending performances and achievements since they entered the league in 1924. The franchise has iced the likes of Frank Brimsek, Tiny Thompson, Eddie Johnston, Gilles Gilbert, Andy Moog, Gerry Cheevers, Byron Dafoe and Tim Thomas as long-term netminders. While those who enjoyed shorter stints include Harry Lumley, Bernie Parent, Jacques Plante, Terry Sawchuck, Pete Peeters, Rogie Vachon and Bill Ranford. But when it comes to the club’s all-time leader in wins and games played the honor goes to 31-year-old Tuukka Rask. 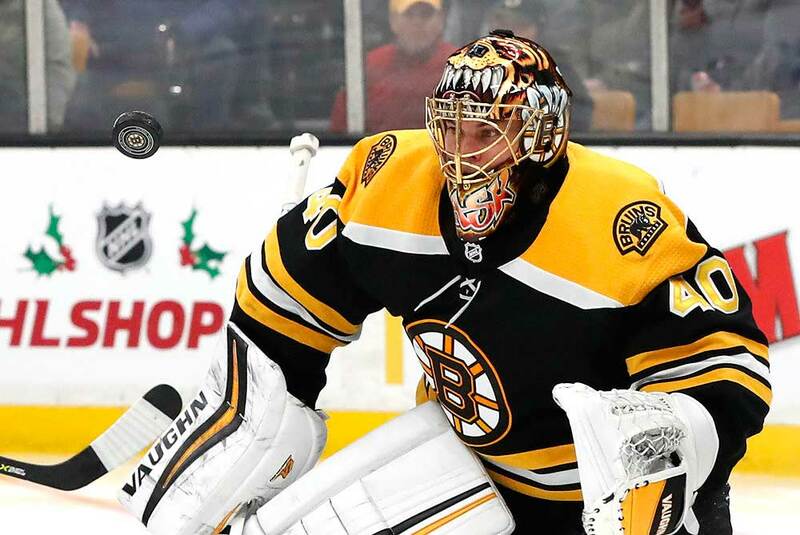 The native of Savonlinna, Finland recently posted his 253rd victory in a Bruins uniform and did it in style with a 24-save, 1-0 shutout on the road over the Washington Capitals on Super Bowl Sunday. The win moved Rask to first place overall on the organization’s win list by leapfrogging Tiny Thompson. And yes we’re playing in another era with overtime games now so you’re allowed to place an asterisk next to his accomplishment if you choose. Regardless, Rask’s is now in the team’s history books and it may be decades before the next Boston goalie overtakes him. It may also be true that his name doesn’t pull as much weight with Bruins’ fans as predecessors such as Cheevers, Gilbert and Thomas etc., but when we look at his overall body of work it shouldn’t be too surprising to find Rask at the top of the totem pole. This a a goalie who won a Stanley Cup in Beantown in 2010/11 and took home the Vezina Trophy and a First All-Star Team nod in 2013/14. He also helped his homeland to a bronze medal at the 2014 Olympic Games and was named the best player at the 2005/06 World Junior tournament. As for the previous record holder Thompson, he won 252 games for Boston between 1929 and 1939 and managed the feat in 468 games. Rask set the new mark in his 477th regular-season appearance. Rask has been in Boston since making his NHL debut in 2007/08 when he shared the net with Tim Thomas. After playing in Providence of the AHL, Rask cracked the lineup full time in 2009/10 and went 22-12 in 45 games as a rookie with five shutouts. He also shone with a goals-against average of 1.97 and a 93.1 save percentage. Rask was the only goalie that season to record a GAA below 2.00 and also led the league in save percentage. But remarkably he wasn’t a finalist for the Calder Trophy as the NHL’s rookie of the year. In fact, he was the only qualifying rookie goaltender in NHL history to post a GAA under 2.00. Thomas was back in top form in 2011/12 and Rask appeared in just 29 games in his second season while registering the worst GAA in his big-league career at 2.67. Rask watched from the bench as Thomas led the Bruins to the Stanley Cup and won the Conn Smythe Trophy as the playoff MVP. Thomas decided to sit out the 2012/13 season and was eventually traded to the New York Islanders leaving Rask as king of the Boston crease ever since. As of Feb. 6th his career stats were impeccable with a regular-season mark of 254-145-57 in 478 regular-season games with a 2.26 GAA and a save percentage of 92.2. He’s gone 35-30 in the playoffs with a 2.25 GAA and 92.4 save percentage. He’s 15-8-4 this season with a 2.35 GAA and 92.2 save percentage and has found his groove after several shaky performances early in the campaign. Rask has also had to deal with concussion problems this year and has shared the crease with Jaroslav Halak, who’s appeared in 27 contests. It’s now Halak’s turn to struggle though with a 0-2-1 record in his last three outings with a 3.29 GAA and 84.7 save percentage. With the Bruins still jostling for playoff positioning it’s a good bet head coach Bruce Cassidy will lean on Rask as his undisputed number-one down the stretch. Rask’s career has certainly turned out well and it’s a long way from over, but one wonders how his path may have differed if he had stayed with the Toronto Maple Leafs organization. He was originally drafted by the Leafs with the 21st overall pick in the first round back in 2005. However, he was shipped out of town before he had the chance to step on the ice in a Leafs uniform. Leafs’ general manager John Ferguson Jr. dealt Rask to Boston on June 21st, 2006 in return for fellow goaltender Andrew Raycroft. At the time, the trade didn’t seem that lopsided since Raycroft was named the NHL’s rookie of the year for 2003/04. Toronto already had another young goaltending prospect in the system in Justin Pogge and Ferguson mistakenly believed he had more upside than Rask. Pogge ended up playing a grand total of seven NHL games. Raycroft was a workhorse for Toronto in 2006/07 as he played 72 games and posted a 37-25-9 record. The Leafs missed the playoffs, but Raycroft tied Eddie Belfour’s franchise record for wins in a season. However, his GAA was 2.99 and his save percentage was 89.4 which ranked 49th and 56th in the league respectively. Raycroft played just 19 games the next year as Ferguson acquired goaltender Vesa Toskala and was placed on waivers at the end of the season and eventually bought out. What infuriates Leafs’ fans about the deal for Raycroft is the fact the Bruins were just about to give up on him and release him. However, Ferguson then came knocking with the offer of Rask’s services. No wonder the trade is commonly regarded as one of the worst in Leafs’ and NHL history. Rask can thank his lucky stars for Ferguson’s ineptness since it’s likely he wouldn’t have succeeded at the same level with a Toronto side that has missed the playoffs 10 times since he was drafted. And to rub salt into the Leafs’ wounds, Rask and his Bruins’ teammates knocked them out of the playoffs in two of the three seasons they’ve made the postseason since 2005. The Bruins sent them packing in game seven of each series with the Leafs holding third-period leads in the pair of them. Rask will go down in history as one of the Bruins best-ever goaltenders. Exactly where he ranks is up for debate. But with every win and game played he’s adding to the franchise record in each category. Besides, with the Thaumatodryinus Tuukkaraski wasp species in Kenya, Africa being dubbed after him, Rask’s name will never be forgotten.